Why Were Old Jet Engines So Much More Smoky Than Newer Ones? The dawn of the jet age saw the skies near major airports raked with thick black smoke trails. 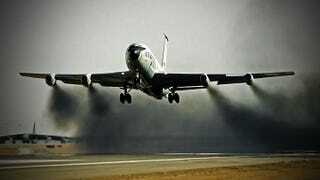 These exhaust plumes have largely disappeared from our atmosphere due to continuous jet engine innovations. Here is the story of the jet engine’s amazing change in visual and ecological signature since its introduction into service almost 75 years ago. Jet engines are one of the most transformative technologies of the last century. They’ve accelerated the pace of transportation beyond anything previous and even enabled change in modern culture and society. 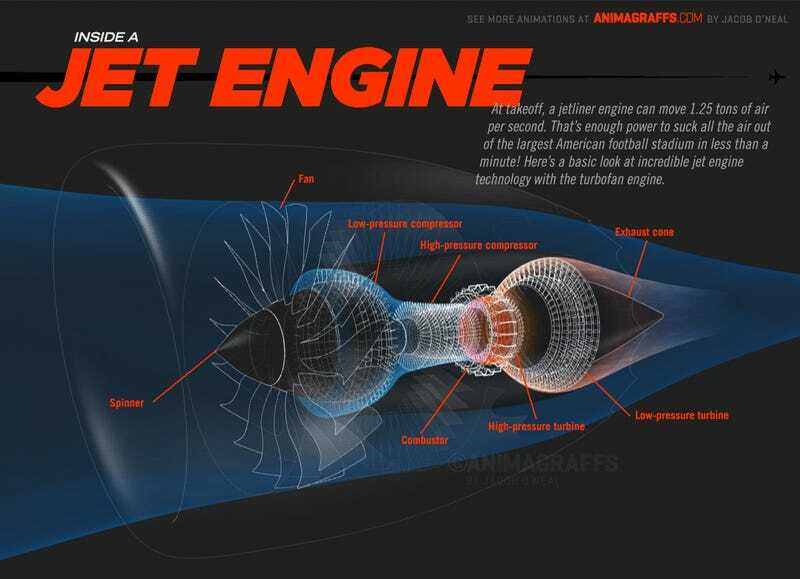 But not all jet engines are created equal. Some, particularly in older aircraft, are known to produce much more visible exhaust than others. Whether you’re more concerned with the progression of technology or the protection of the environment, it is interesting to see what has changed since jet-powered aircraft first took to the skies. The visible part of a jet engine’s exhaust is the result of highly compressed air, very high temperatures, combusted fuel and in some extreme cases where smoke is particularly thick, water injected into the mixture. Here are the reasons why many older jet engines are known to make more inky, acrid smoke, especially on takeoff, than newer models. The first type of jet engine to enter widespread commercial use was the turbojet, which didn’t incorporate bypass into its design. Bypass, at its essence, it is air that is directed around the engine core. By their nature, no air is bypassing the turbojet engine—it all enters the system. 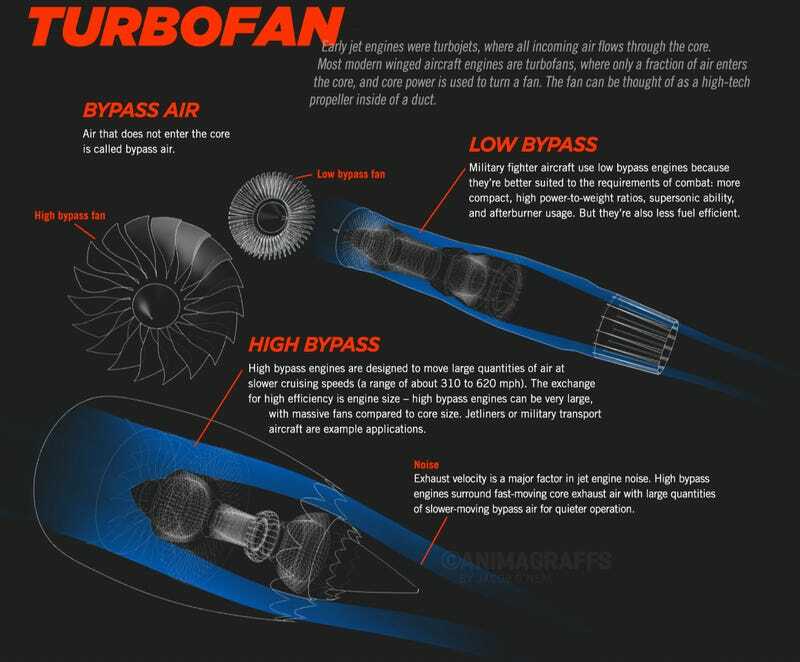 A turbojet is essentially the engine core of a turbofan. The turbojet consists of a compressor stage in which air is squeezed together and made more dense, before being rammed into the combustor stage. Once there, the dense air is combined with fuel and ignited. 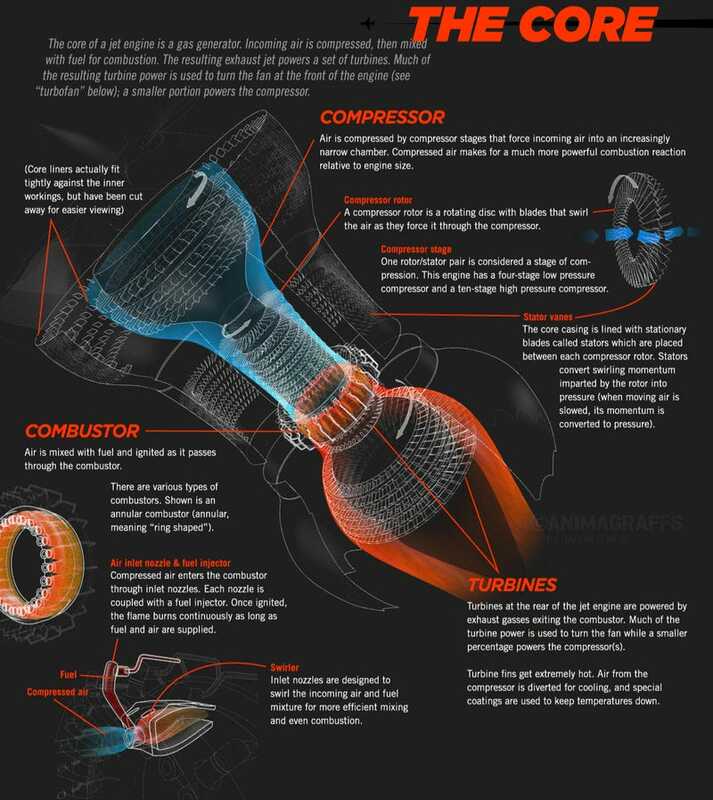 This combustion creates the force that spins the turbine at the rear of the core. So, with turbojets, all of the air is sent through the compressor. There is no bypass at all. Got it? Now let’s look at turbofans. The difference between bypass turbofans and turbojets is that some air, as the name suggests, bypasses the turbofan engine’s core (also called the hot section, because that is where the combustion is happening). In a low bypass turbofan design, there is less space between the engine core inlet and the exterior of the engine shroud than in a high bypass turbofan. This allows the low bypass turbofans to fit into a smaller physical package, which is ideal for small combat aircraft, but their design isn’t as efficient as high bypass models. Low bypass emerged before high bypass and is still commonly used today in military aircraft because of desirable characteristics including the aforementioned compact packaging, the ability to use afterburners, the ability to operate at supersonic speeds and having a higher power to weight ratio. The U.S. Air Force maintains the relatively inefficient and notoriously smoky low bypass turbofans in the B-52H bomber at great expense, despite many proposals to re-engine the fleet with upgraded high bypass turbofans. The B-52 is expected to remain in service with the USAF for several more decades. The venerable Boeing 707 has been fitted with turbojets, low bypass turbofan and high bypass turbofan engines throughout its history. The 707 first flew in 1957 and was Boeing’s first ever jet-powered airliner. Over 1,000 examples in various commercial and military variants (including the E-3A Sentry AWACS and KC-135 Stratotanker) were built over the course of the next three decades, many of which are still in service today. A turbofan’s bypass ratio is expressed numerically, as in the Pratt & Whitney JT3D (first flight tested in 1959) low bypass turbofan which has a bypass ratio of 1.42:1. By comparison, a modern Pratt & Whitney PW4000 high bypass turbofan, which has seen use in a variety of modern airliners including the Airbus A330, Boeing 747 and Boeing 777, has a bypass ratio of 5.3:1. The higher number means (5.3 vs 1.42) indicates that the ratio of air bypassing the engine core is higher. In addition to billowing lots of black smoke, turbojets and low bypass turbofans can also be fitted with an afterburner to create an even more violent combustion of superheated air and fuel. Afterburners are fitted downstream of the engine core and reheat the exhaust gases by dumping fuel into the exhaust stream. 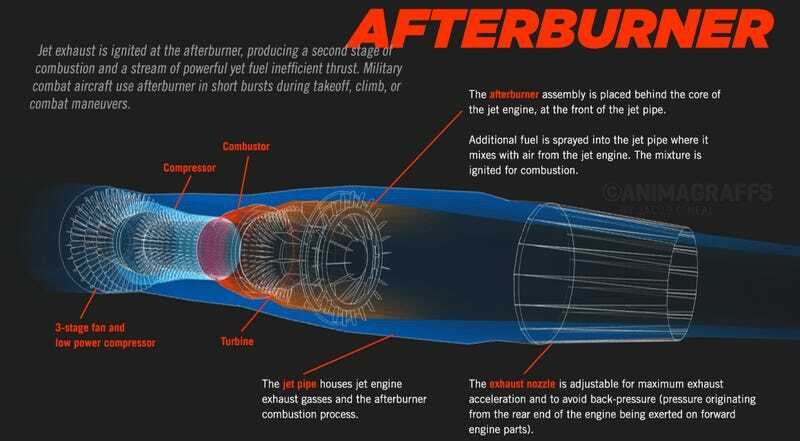 This consumes fuel very quickly, which is why afterburners are usually found on aircraft capable of supersonic flight. Notably, some advanced aircraft are able to achieve supersonic flight without the use of afterburner. This is called supercruise, and is a known capability of the USAF F-22A Raptor air superiority stealth fighter. It is also very likely to be a capability of the Russian T-50/PAK-FA 5th generation stealth fighter. Other aircraft with supercruise ability include the Eurofighter EF2000 and Saab JS-39E/F Gripen under certain conditions. Low bypass engines aren’t as efficient as high bypass engines, but water injection is the technology that is most responsible for the seemingly-eerie pictures of older airplanes riding black columns of smoke into the sky. Water injection in aircraft works on the same principle as water injection systems work on turbocharged automotive engines (hi, Jalops). The idea in turbojets and turbofans is to cool down the engine core by spraying de-mineralized water into the incoming charged air. This has the effect of cooling the entire engine core and adding mass to the exhaust, thereby increasing thrust. Because the engine core is cooled by the injected water, the combustion chambers aren’t able to burn all of the fuel and water mixture, so some particles of the fuel and water are vented out the engine, which materializes in the form of the characteristic black smoke. Water injection systems are typically used to produce extra thrust at takeoff. Once airborne, the water injection systems are then switched off for the remainder of the flight. The B-52 Stratofortress has developed a reputation for its smoky takeoffs and climbouts. The legendary bomber originally featured eight water injected J57 turbojets but the H model (which is still in service today) received the upgraded TF33 low bypass turbofans, which is the military variant of the Pratt & Whitney JT3D powerplant also found in some 707’s. The TF33 is also used in the C-141 Starlifter, a Cold War-era USAF cargo airplane. The Harrier jump jet, which has vertical take off and landing (VTOL) capability, uses water injection in its Rolls-Royce Pegasus engines to increase performance during takeoff. Harriers can carry up to 50 gallons of distilled water, which is enough for approximately 90 seconds of water injected into the combustion chamber. The video below shows water injected B-52 bombers conducing a Minimum Interval Take Off (MITO) drill. The display is certainly impressive, but the amount of black smoke produced in the exercise is truly a sight to behold. So, low bypass turbofans and water injection are the biggest reasons why older jet engines tend to make more visible smoke than newer jet engines. Of course, there are always other reasons why any jet engine, old or new, could be producing visible smoke. Dirty fuel injectors, or any other part involved in the combustion phase in the engine core could potentially offset the efficiency of the rest of the machine and cause a more smoky output. Even though modern airplanes with high bypass turbofan engines still release large amounts of carbon emissions into the atmosphere, they don’t smoke in the the sky like earlier jet engines did (and still do). Jet engine technology has come a long way in reducing visible atmospheric pollution, and while the takeoff pictures aren’t as dramatic without the trails of smoldering soot, we are much better stewards of the environment because of it.